Algonquin Pet Waste Drop Box Fight Closer To Trial - KRV Legal, Inc. The case of the kidnapped doggy waste container inched closer to trial this week when a McHenry County judge denied an Algonquin woman’s request he dismiss a criminal charge alleging she unlawfully removed the receptacle from its perch outside her home. 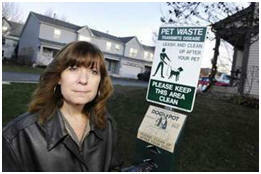 Judge Charles Weech rejected Carrie Fosdale’s argument that she, as a part owner of the receptacle installed by her homeowner’s association, had the right to remove it. Fosdale, 46, faces a theft charge alleging she stole the receptacle – a small container hung on a post with a sign stating its purpose and contents – in October. The container had been placed about 25 feet from Fosdale’s home in the Old Oak Terrace townhouses on the village’s east side. Fosdale has not denied removing the container, but said she did so out of protest and frustration when her homeowners association did not respond to her concerns about its proximity to her residence, the odor it was giving off and the flies it was attracting. Her defense had been asking Weech to throw out the case, arguing that she, as a member of the homeowners association, had authority to move it. “As such, this is a dispute between property owners as to the rightful placement of said property,” Fosdale attorney, George Kililis, said in court filings. Weech, however, sided with prosecutors, who argued that even if Fosdale has an ownership stake in the receptacle, it does not mean she could take it. “She had no right to exert unauthorized control of the property to the detriment of the other owners in common,” Assistant McHenry County State’s Attorney Jessica Carrier stated. Despite the setback, Fosdale is not giving up on getting the case thrown out before it goes to trial. Kililis said Thursday he already has filed a second motion to dismiss, this one arguing that his client had no intention of permanently keeping the container from its other owners. The case is scheduled to be back in court July 9 for a pretrial status hearing. The charge against Fosdale is a Class A misdemeanor punishable by a maximum one year in jail and $2,500 fine.